Bonn, 1 June 2017 - Great Bustard experts from across the globe met in Ulaanbaatar from 24 to 30 May to plan the conservation of the Great Bustard in Asia. The Great Bustard is the heaviest bird capable of flight and in Asia are even rarer than snow leopards. The conference hosted experts from nine countries, including China, Kazakhstan, Kyrgyzstan, Mongolia, the Russian Federation, Tajikistan, Uzbekistan, the United Kingdom and the USA, and included contributions from Iran and Turkmenistan. 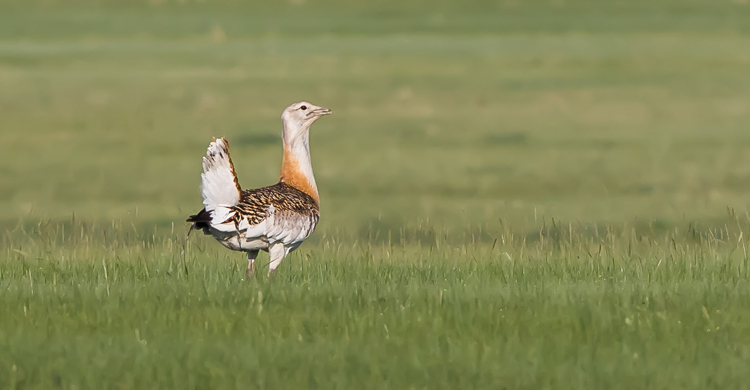 Western European Great Bustard populations are now either stable or increasing but in the east there is conservation concern as the numbers are declining. The conference concentrated on identifying the threats to the birds at different times of the year in breeding, stopover, and wintering sites, and on international cooperation to remove or reduce these threats. Major threats to the species in Asia are illegal hunting and poisoning for meat, and loss of habitat in certain areas. The conference was supported by the Mongolian Government and organized by the Wildlife Science and Conservation Center of Mongolia and the Eurasian Bustard Alliance. The meeting was possible thanks for funding provided by the Trust for Mutual Understanding, an American organization that promotes cooperation among Central Asian States. “This meeting is a milestone in terms of initiating a process of cooperation for the conservation of a severely threatened species. The Great Bustards cross international boundaries during their migration and coordination of conservation measures between countries is needed to be effective”. The Great Bustard is the heaviest flying bird in the world, and males can weigh more than 20 kg. The species lives across the northern hemisphere from Eastern China through to Western Europe. The eastern race of the species is migratory and moves south for the winter, sometimes moving over 2,000 km. The male is much larger than the female, sometimes four times heavier, but the female does all the incubation and rears the chicks herself. The Asian population has declined in recent years and it is now thought that there are fewer than 2,500 individual birds left. The reasons for the decline include illegal hunting, changes in agriculture and the dangers posed by electric power lines.